Despite inflated pre-summit expectations that US President Donald Trump and North Korean Chairman Kim Jong-un would sign a deal involving at least some sanctions relief, liaison offices, an end of war declaration, and agreement for North Korea to dismantle its nuclear facilities, the fact that Hanoi summit failed is not a welcoming development. Without a doubt, the collapse of the summit was also a bitter pill for South Korean President Moon Jae-in to swallow, as Moon has been pushing for sanctions relief to realise his “New Economic Community” with North Korea. Kim understood South Korea would prevent a collapse of US-North Korea talks and opt to push for economic cooperation at all costs. Such disappointment from South Korea is a result of Moon’s high but unrealistic expectations regarding the pace of the denuclearisation process. Several days before the Hanoi summit, the Moon administration prepared to unveil the “new Korean Peninsula regime.” Moon argued that the new regime would reflect the new regional order after North Korea and the US ended the Korean War, and would help facilitate inter-Korean economic cooperation and put South Korea at the helm of peninsular affairs. Unfortunately, when the US and North Korea still failed to narrow their differences over the definition of the “denuclearization of the Korean peninsula” and sequencing, Moon’s overconfidence and aloofness from real developments was a catalyst for the summit to collapse. However, in his 1 March address following the summit, Moon was optimistic the talks in Hanoi had brought progress in the denuclearisation process. He outlined his determination to resume the Kaesong Industrial Complex and Mount Kumgang Resort under the new Korean Peninsula regime. South Korea and the US also ended the springtime military exercises Key Resolve and Foal Eagle, and unveiled the lower-level Dong Maeng exercise to sustain diplomacy with North Korea. 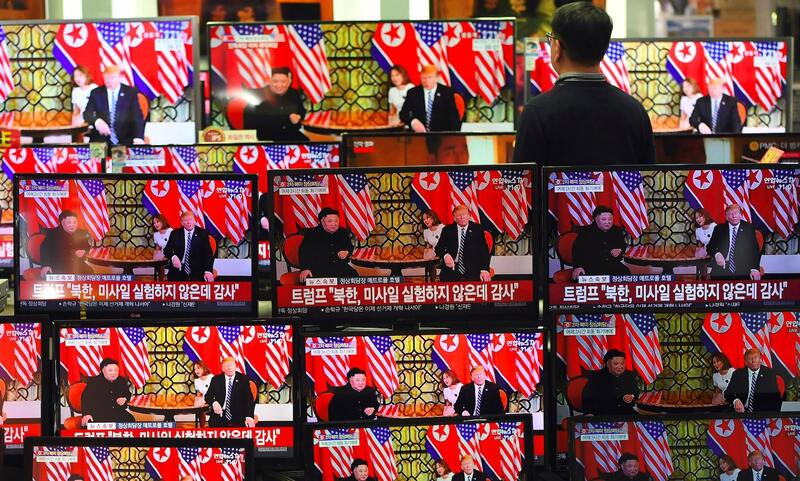 These measures come in the absence of even minimal North Korea’s dismantlement of its nuclear program or Pyongyang rolling back of its own spring military exercise. Such disproportional concessions will plague the denuclearisation process and discourage North Korea from taking diplomacy with the US and the South seriously. North Korea’s “selective détente” has given Kim much leeway to approach the US and South Korea. Kim’s emphasis on continuing the peace process with South Korea regardless of the denuclearisation process outcomes in his New Year Address allowed him to request disproportional concessions. Kim understood South Korea would prevent a collapse of US-North Korea talks and opt to push for economic cooperation at all costs. As a result, Kim asked the US to lift the most recent five United Nations sanctions adopted between 2016 and 2017 in exchange for the dismantlement of the main nuclear reactor and the plutonium reprocessing plant at the Yongbyon facility. If agreed, the deal would largely invalidate the Trump administration’s “maximum pressure campaign” while leaving the tritium production facility vital to the North’s Intercontinental Ballistic Missile program and thermonuclear warheads intact. Even though Kim could not get sanctions relief due to the collapse of the summit, he would still be able to drive a wedge between the US and South Korea while improving the survivability and lethality of his nuclear arsenal. On the eve of the Hanoi summit, there was speculation the Yongbyon facility was still producing plutonium. Kim’s lack of reference to the tritium facility during the talks also showed that North Korea is set on maximising the yield of its nuclear weapons before it can enhance the accuracy of its long-range missiles, which is a key step in the acquisition of a functioning ICBM arsenal. Moreover, it’s not only the US and North Korea that disagree over the sequencing of the denuclearisation process. The US and South Korea also conflict over the pace of sanctions relief. The Moon administration saw sanctions relief as a part of a wider process to engage and establish an economic union on the peninsula, and that those sanctions must be lifted early to signal Seoul and Washington’s intentions to “normalise” relations with the North. Yet the Trump administration saw sanctions as the key leverage to bring North Korea to the negotiation table and even partial sanctions cannot be lifted if the US fails to account for North Korea’s nuclear sites other than Yongbyon. Although Trump counted on Moon to continue his mediating role, there is a possibility that Moon’s declining approval rating would push him to prioritise inter-Korean economic cooperation, while being oblivious to real progress on the denuclearisation front as he was before and during the Hanoi summit. With the collapse of the Hanoi summit and the uncertainty of North Korea and US intentions in the aftermath, South Korea’s mediating role is more important than ever. Unfortunately, as North Korea is exerting more pressure on the denuclearisation process due to its continued nuclear production and missile bases expansions, Moon’s efforts to keep the peace and the denuclearisation process balanced are in great peril. Should South Korea stray from its mediating role, it will spell disaster for North Korea-US relations. In the meantime, it is important for Seoul and Washington to recognise North Korea’s it applying a wedge strategy, and to coordinate their responses to bring about real progress in North Korea’s denuclearisation.